"On the eastern bank of the Mississippi River, about an hour upstream from New Orleans, the outline of Nucor Corporation's new $750 million iron-processing plant is rising between fields of sugar cane and sweet gum trees. It’s a harbinger of a nationwide investment boom spreading from the oil fields of North Dakota and the Marcellus gas shale in Pennsylvania to power plants in California and chemical refiners in Texas. A surge in U.S. natural gas development has spurred $226 billion in spending plans on pipelines, storage, processing facilities and power plants, most slated for the next five years, according to Industrial Info Resources, a market- intelligence provider in Sugar Land, Texas. 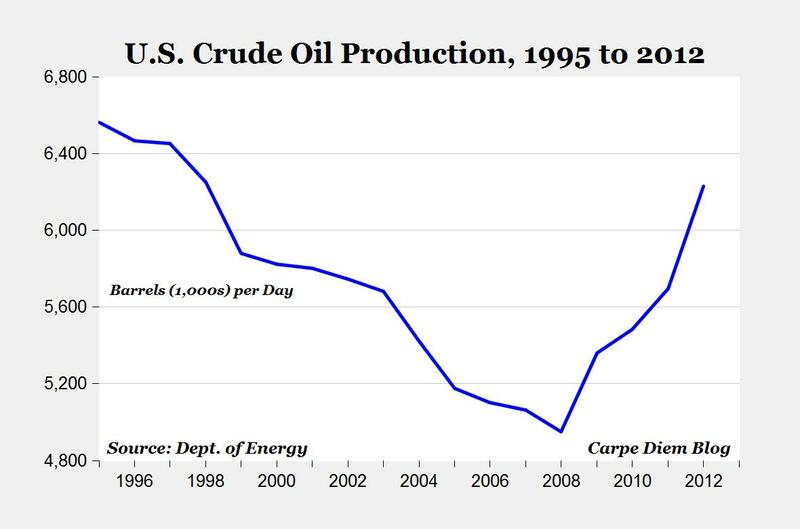 U.S. energy supplies have been transformed in less than a decade, driven by advances in technology, and the economic implications are only beginning to be understood. U.S. natural gas production will expand to a record this year and oil output swelled in July to its highest point since 1999 (see top chart above). Citigroup estimated in a March report that a “reindustrialization” of America could add as many as 3.6 million jobs by 2020 and increase the gross domestic product by as much as 3 percent. There are signs the economic gains have begun to expand beyond the oil and gas fields and that the promise of abundant, low-cost fuels will give a competitive edge to industries from steel, aluminum and automobiles to fertilizers and chemicals. That would provide a boost to a U.S. manufacturing sector that has lost 5.12 million jobs since 2001 and become the focus of a national debate over how to revive factory employment. Manufacturers have added 532,000 jobs since January 2010 as the economy started to recover, Bureau of Labor Statistics data show. 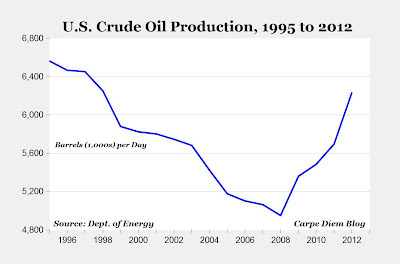 The expansion of fossil-fuel production -- coupled with a weak economy and increased energy efficiency -- has helped the U.S. pare its crude oil imports by 17 percent since the 2005 peak, Energy Department data show. 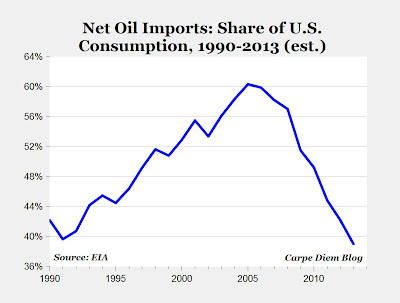 Imports in 2011 accounted for 45 percent of U.S. consumption of crude and refined products. The department predicts the share will fall to 39 percent next year, which would be the first time since 1991 that imports dropped below 40 percent of demand (see bottom chart above)." MP: As I have commented recently, America's ongoing energy revolution is one of the real bright spots in an otherwise sub-par economic expansion, and provides one of the best reasons to be bullish about America's future. The Bloomberg article highlights many of the direct and indirect economic benefits that are flowing through the economy from America's abundant energy treasures. The fact is we're consuming about 4.5 Million bpd less oil/products than we were in 2007 (one reason our economy can't get out of its own way,) and we're Still Importing about 8.9 Million bpd of oil. I have caculated the combined decline rate of four deepwater fields in the Gulf of Mexico, Thunder Horse, Atlantis, Tahiti and Blind Faith. The four had a combined production of of 583,144 barrels per day at their peak on September 2009. In May of this year they had a combined production of 205,399 barrels per day. That is a decline rate of over 24 percent. However that figure is slightly exaggerated because Atlantis completely shut down on about April 2nd and remained shutdown the entire month of May. In March Atlantis produced 61,362 barrels per day. But even if they had produced that much in May the combined decline rate of the four fields would still have been around 20 percent per year. 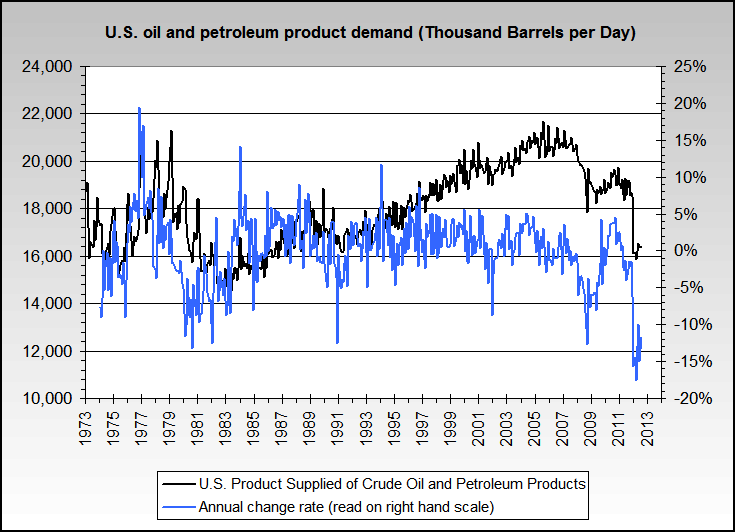 "A more inclusive picture, oil & petroleum imports, 1973 to date"
Well, those are interesting charts, Bart, aren't they? Interesting to see that (in recent months/years), while our share of imported oil consumption has fallen, OPEC's share of the imported oil has risen. Does that mean we are purchasing less oil from NON-OPEC members, and more from Saudi Arabia and Iraq? Why hasn't the Obama Administration put a stop to this dangerous practice? Few to none of those jobs are permanent, direct, or otherwise traditionally long-term work arrangements. I dont mind the oil. However, I do mind the antagonism that businesses have against the people that work for them. The South's feudalistic "tyranny by contract employment" model needs to die, not expand to places like ND. 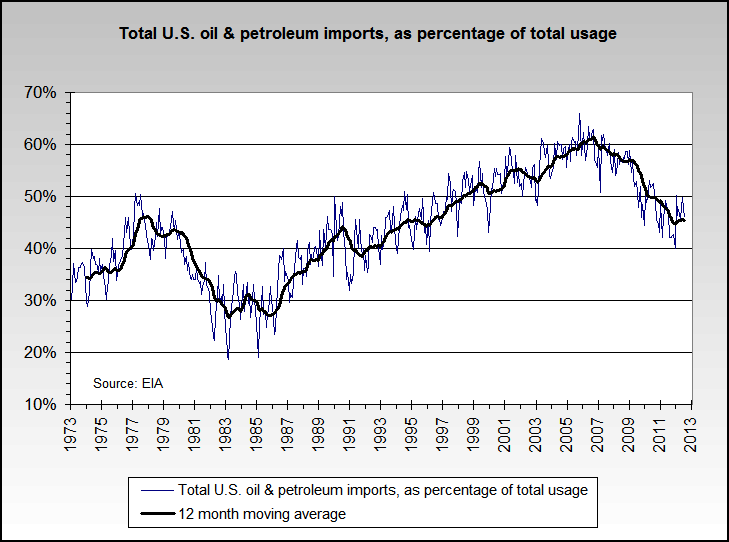 Not sure where you got that chart from but a simple google search gave me this chart that shows OPEC as having only about 41% of total imports for April 2012. Why does your chart show about 60% for OPEC? Thanks, Bart, that's a great chart, and it would be *perfect* if it also included a line for persian gulf imports as a percentage of imports. Why hasn't the Obama Administration put a stop to this dangerous practice?" If you were paying attention, you'd know he's doing what he can to shut it down. "Few to none of those jobs are permanent, direct, or otherwise traditionally long-term work arrangements." Your former job no longer exists. The world has moved on, and you have not. If you ever plan to work again you may need to prepare for a changed world. No one will do it for you. Jon Murphy, I wasn't picking on Bart. I just saw 60% OPEC share of imports on his chart and did not think it was right so I did a simple google search for the result I linked to. I was only asking him why there was a difference. yeah, I know. Just making fun. Sorry, lost in translation again. I do wonder why there is a difference, tho. "Geez, leave the poor guy alone and make your own damn charts! :-P"
I firmly believe Ricardo had it right, and Bart is way better at charts than I am. "Dependence on foreign charts" is a political scare tactic, and self sufficiency in charts or anything else is a foolish and costly endeavor. GMF: "Jon Murphy, I wasn't picking on Bart. I just saw 60% OPEC share of imports on his chart and did not think it was right so I did a simple google search for the result I linked to. I was only asking him why there was a difference." JM: "yeah, I know. Just making fun. Sorry, lost in translation again." Also lost in translation, apparently, are identities. The comment Jon picked on was mine, I think, and I understood it to be fun-poking. Both of you need to get pictures on your profiles so I can easily tell you apart. But the question remains, why the difference? My chart only goes to April 2012, Bart is your's more up todate? If so, that is big news that OPEC went from 41% to 60% in a few months, a 50% increase? Did I miss some world changing event during the last couple of months? Okay, now I am picking on him a bit. I would if I knew. I don't post comment much, CD is the only place and I only started a few months ago. Still trying to figure out how to bold/italicize my posts! And more seriously, I have no clue where to find persian gulf only data. You can bold and italicize using the HTML tags under the comment box. For example, if you type "< b >" (no quotation marks or spaces) followed by your writing followed with "< / b >" (again, no quotation marks), then your text will be bolded. It will work the same with "i" for italics. To set up a picture, on the main screen of the blog, up in the top right, it should say "dashboard" next to your email address. Click on that link. On the next screen, in the upper right, it will say your name with a little drop down arrow. Click the arrow and there should be a link that says "account settings." You can but a profile picture in there. It seems Bart that you imported a Thousands Barrel a Day chart onto a Percentage Of Imports chart, hence the difference. It looks like Bart's chart is petroleum plus petroleum products while GMF's chart is just petroleum. That could account for the difference. Thanks for the tips Jon Murphy. 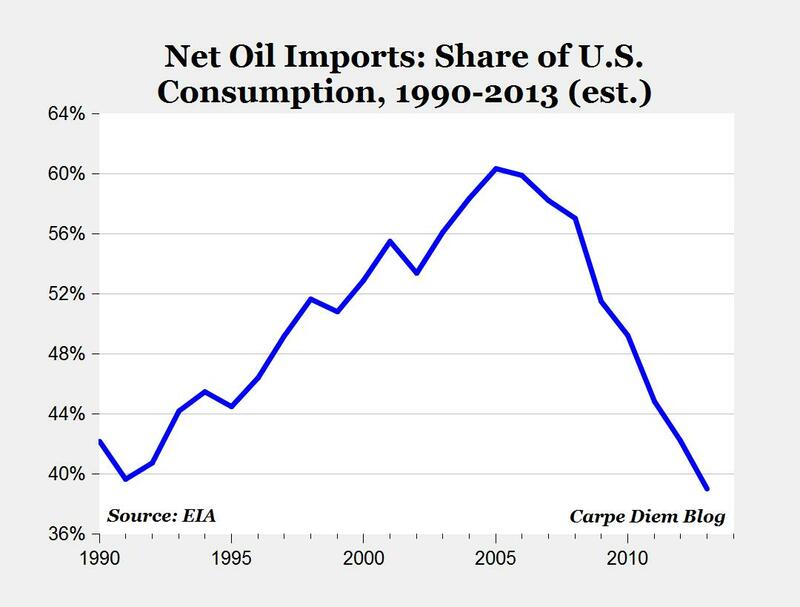 Here's the EIA data that I'm using for America's "Net oil imports." There is also data here for imports from Persian Gulf and OPEC. 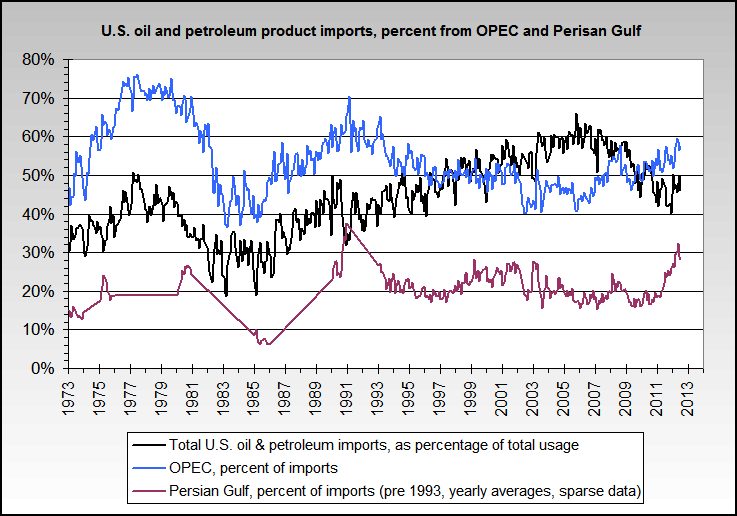 There is also data here for imports from Persian Gulf and OPEC. There ya go, Ron. Now you can make your chart. Or, for $20, I'll make it for you. The huge majority of the time when there's a choice between two or more data series, I use the most inclusive one. If that is the case then Bart I owe you an apology. Thanks Dr. Perry, that link gave me enough of a tip to locate the more current data series. It onluy goes back to 1993 sdo I used your EIA link to fill in a few more years. I think so. The EIA links I use (the OPEC one I linked earlier, the Oersian Guld new one is http://www.eia.gov/dnav/pet/pet_move_impcus_a1_MP0_ep00_im0_mbblpd_m.htm ) have May info. MP: As I have commented recently, America's ongoing energy revolution is one of the real bright spots in an otherwise sub-par economic expansion, and provides one of the best reasons to be bullish about America's future. The Bloomberg article highlights many of the direct and indirect economic benefits that are flowing though the economy from America's energy treasures. It seems to me that you cherry pick data to support your narrative without looking at the total picture. We would expect that when you drill thousands of new wells in tight shale and tight sands production and when there are hundreds of billions in new investment in oil because of the price explosion you could increase production. But this is only 'sustainable' if the investment can generate positive returns and you cannot find any evidence to support that claim for the non-conventional side. and yes, I do have it. "A surge in U.S. natural gas development has spurred $226 billion in spending plans on pipelines, storage, processing facilities and power plants, most slated for the next five years." If I'm cherry-picking, I'm in pretty good company since I've got about a quarter of a trillion dollars of investment on my side, and that's just part of the investment boom taking place due to shale gas and oil. The same was true during the tech and housing bubble. It was very crowded during the heady times and people like me were told that we did not just 'get it'; it was a very different time when everything lined up and would push prosperity higher proving that those who doubted the free lunch scenario were just fools who had been passed by time. Well, things were not different and proper investment required that interest rates were set by markets and that successful businesses generate positive cash flows and profits if they wanted to stay around. The same is true now. I have no trouble with the more than $100 billion that has gone into conventional production because it can be profitable at these prices or lower. What I have a problem with is the story that the investment in unconventional tight gas and oil production in shale formations is wise in the non core areas. While it is easy to see that there are a few very profitable wells the data shows that the average well cannot generate enough cash to pay back the money borrowed to drill it. Even you have to see that unless that changes this bubble will burst just like the previous ones. The trouble is that if you knew enough about the business you will know that the oil companies have leased a great deal of land that is well outside of the core areas and incapable of generating positive cash flows or profits. We have already seen Encana, BHP, and a few other companies write down lousy shale assets. That process has just begun and will continue until the bubble becomes obvious to most people. I hope that by that time you will be off the bandwagon. "There ya go, Ron. Now you can make your chart. Or, for $20, I'll make it for you." Wow. That's a bargain. I'll fax you the $20 right away. "Just for that, I should link that "O" sound byte by Meg Ryan from "When Harry Met Sally"... and yes, I do have it. -g-"
Thanks for the EIA link. That's Great! Yep. It's in my top 10 funniest movie scenes of all time. Rob Reiner was the director. I heard that the lady who says "I'll have what she's having" at the end of the scene is actually his mother - and it made the whole things so audacious & outrageous. You want to excuse the inexcusable. Go back to sleep, sethstorm, and ask your mother to wipe that drool off your chin. how many of those million jobs are truckdrivers hauling millions of gallons of water per well from PA to kansas? Markets in Everything: Indoor RV Park in N.D.